While millions of households around the world struggle to have enough to eat, elsewhere millions of tons of food are being tossed into the garbage. Apart from being ironic and paradoxical, this state of affairs has been around for decades and has not been solved in any form acceptable to scientists or the people who care. The result of this impasse is that a third of all the food produced in the world is never consumed, and the total cost of that food waste could be as high as $400 billion a year. The food discarded by retailers and consumers in the most developed countries would be more than enough to feed all of the world’s 870 million hungry people, according to the Food and Agriculture Organization of the United Nations. The problem is expected to grow worse as the world’s population increases, last week’s anti-waste organization report in Britain found. By 2030, when the global middle class expands, consumer food waste will cost $600 billion a year, unless action is taken to reduce the waste. Many countries are guilty of wasting food. In a country like Saudi Arabia, the waste in rice alone has reached the staggering figure of SR1.6 billion annually. Saudi Arabia imports around 1.1 million tons of rice every year worth SR4 billion. However, around 440 tons are wasted while only 660 tons are properly consumed. Rice and wheat are the main ingredients in the Saudi diet but that doesn’t mean the population should waste food. This is obviously a cultural issue. At home and at schools, people should learn to consume only what they need and avoid excesses that result in waste. They must understand the damage caused by throwing out edible food and take this food before it is thrown away and give it to the needy. The problem is not just in Saudi Arabia. It is estimated that between a third and half of the food produced in GCC countries goes to waste. Despite that, GCC countries are investing in farmlands abroad. It calls into question this policy of GCC countries which have in recent years bought up swathes of land in Africa, Eastern Europe and Asia to provide a guaranteed source of food. Rather than investing in tracts of agricultural land in other countries, Gulf countries should pay more attention to the huge amount of food that is wasted every day. It’s not just food which is wasted. The UAE and Saudi Arabia use around five to six times the amount of water per capita compared to the UK. That means that faucets run unchecked, as if the water supply comes from a bottomless pit. Most people don’t realize how much food they throw away every day — from uneaten leftovers to spoiled produce. 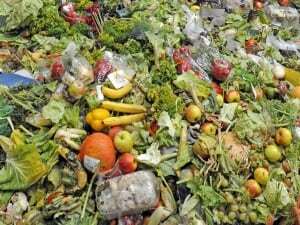 Nor do they really care that reducing food waste from 20 percent to 50 percent globally could save $120 billion to $300 billion a year by 2030, as the report found. Food waste is a serious environmental and economic issue but that doesn’t seem to have much of an effect on consumers. The world’s farms already produce enough food to feed almost 12 billion people. That’s almost twice the current level of the world’s population. But then, more than a billion people suffer from acute hunger. So it’s not a question of too little food in the world. There is enough food to go round but so much of it is being needlessly and senselessly thrown away.